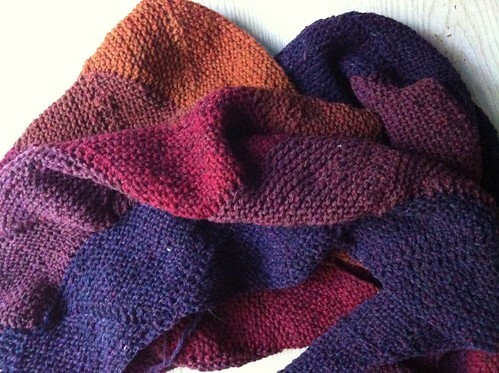 knitted :: Sunset Aranami, originally uploaded by earthchick. I am so ridiculously excited about my Sunset Aranami, which I finished up on our way home from Georgia a few days ago. I still need to weave in the ends and block it before I show it to you, but here’s a little peek. Isn’t this going to be so pretty for fall? 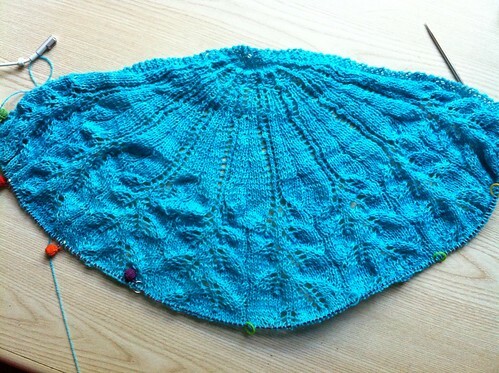 And now that I’ve finished my Aranami, I’m turning my attentions back to the TTL Mystery Shawl. I finished up Clue 3 (out of 5) yesterday and am happily moving ahead with Clue 4. This yarn is a dream (Jade Sapphire Silk/Cashmere in “Curaco”). I’ve never done a Mystery Shawl before, but of course you can’t go wrong with a TTL pattern, so I had no qualms. And speaking of TTL shawls, don’t forget that today is the last day to enter my little giveaway, for a chance to win my handknit Nefertem shawl or one of five patterns for the shawl that Kirsten Kapur is generously giving away. Read about the giveaway here and enter to win by leaving a comment on that post. Thanks! I am all about shawls right now too. No time for much other than “work” knitting, but my knitting fantasies (and my queue!) are full of them. Hopefully in a few months when things settle down a bit I’ll be able to cast on a few! I’m also knitting a lot of shawls! They’re such pretty accessories and they knit (relatively) quickly. I have a lot of sweaters in progress too, but I guess shawls also seem better in summer. I think it is truly great that you remember and celebrate the lives of your children on this day every year. It keeps me believing. And I also want that shawl. I’m SO crossing my fingers for that shawl 😉 Love your blue shawl! I’m only a few rows into part 4…it just keeps getting put to the side! ACK! That Sunset Aranami is gorgeous, Stacey! So very beautiful….! Ooh, I love that Aranami! What perfect color choices.